Hi, first off I am new to 3d modelling and this is my first complete project. 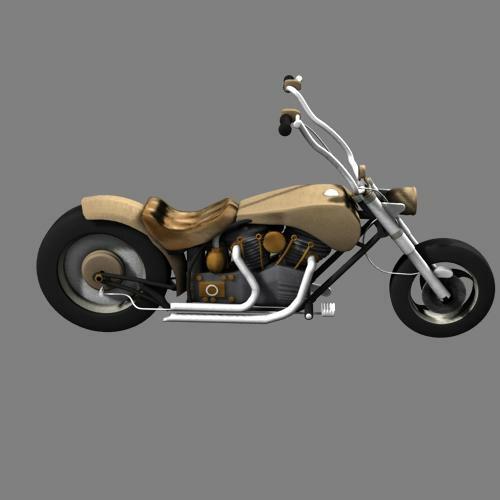 The custom chopper was modeled using blender, but I do wish to take this model into both daz and poser. However I wish to ensure my work meets the high standards of the market place. Question: am I required to uv unwrapp the entire model? I only use eight texture images for the entire model. The remaining elements are just colours assigned to the relevent areas of the model with no texture maps applied. Comments most welcome on the first image which is a blender default render image. It would be best to UV map the entire model. Although you are not using texture maps on all surfaces, someone might want to apply one in the future for bump or reflection. I do not believe that chrome does a good reflection using only texture coordinates as opposed to UV. I do not know what kind of grouping Blender uses, but DS and Poser can use the same type of grouping for rigging. I assume you will want to rig the model so the wheels will rotate and the fork steerable. Also, I assume the model is still incomplete because I see no connection between hub and rim on wheels. Areas that could require bump/displacement or other kinds of maps absolutely must be UV mapped. Areas like chrome don't have to be, but since most metal materials in the DS/Poser world use reflection maps, they should be, too. In short, unless you are providing your own shaders (not presets) then yeah, map it all. am I required to uv unwrapp the entire model? If you have texture maps used in any part of the model then that part should be UV mapped, whether you use a standard mapping, like Box, cylindrical, spherical,.. etc, or use UV Unwrapping is your choice, but most Figures and clothing use Unwrapping to create the UV layout's, (which are available for most products) so that the users, or other published artists can also create "alternative" texture maps. For the parts which use shaders,. then these should also have some type of UV Mapping applied, to enable texture based shaders to be used. Basically all models you create in any 3D program should (By default) have some standard type of UV mapping which is automatically applied to them,.. when you create them. If you later want to alter that default UV mapping, or change it to UV Unwrapping,.. that would depend on the shape of the model and how you want to texture it. Depending on how the model is made, and what you think should be changeable (tank colour and details) ( seat colour and details) then these areas should be UV mapped, and Unwrapped and they should be separate parts, and use different shading domains, so that they can be textured differently or Hidden,. using alternative maps or shader options. As far as I am aware, officially at least OBJ does not support partial mapping so if you are going to export to OBJ you need some kind of uv mapping for the whole thing - though depending on intent you may not need good uv mapping everywhere. Yes, I just meant that - again, as far as I am aware - that if an OBJ is uv mapped all of its polygons must be uv mapped, though the mapping can be overlapping or completely random. I'd also add that, depending on how Colpolstudios want the model to function in DS or Poser,. it would be best to export the model in parts, for example, the Wheels, so that they can be rotated separately, and perhaps the front forks, for the same reason. then I think you'd need to create a figure, or possibly just parent the parts together. Hi first thank you all for your help and time. Sorry for the late reply but I spent most of today bringing the chopper into daz. Update: every single item in the scene / model is now uv-mapped. Please note this is very much a work in progress with the daz studio render. The model is now made up of the following sections. Frame, engine, forks, rear brake drum assembly, rear tyre and front tyre. I had the model built in many layers so it took a little time to work out the best setup for use in daz or poser. The idea is the frame will be the base and all the seperate pieces will be parented to this. I then used the snap origin to snap the origin to the centre of the wheels. 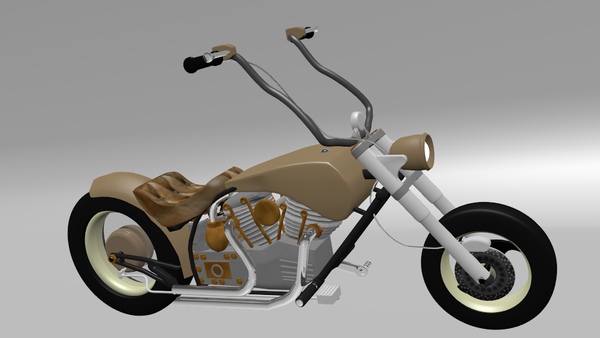 I have the model of the R-75 Moto and have been looking at this in order to learn more about setting up a motorbike in daz. The first main difference is the R-75 Moto has a three box icon for the entire model. This then can be expanded out to the various sections of the bike, but most worring for me is the little bone adjacent to each section of the bike, I assum this means rigging? It seems the entire bike is grouped. So my first step should be to group the model? Currently all of the pieces are parented to the frame. Altough I moved the origin for the front forks when I rotate this section the wheel will not move with the front forks. parenting the front wheel to the forks is not correct, this leads me to thinking I will need to rig my model. If someone would be kind enough to point me in the right direction with help and advice.